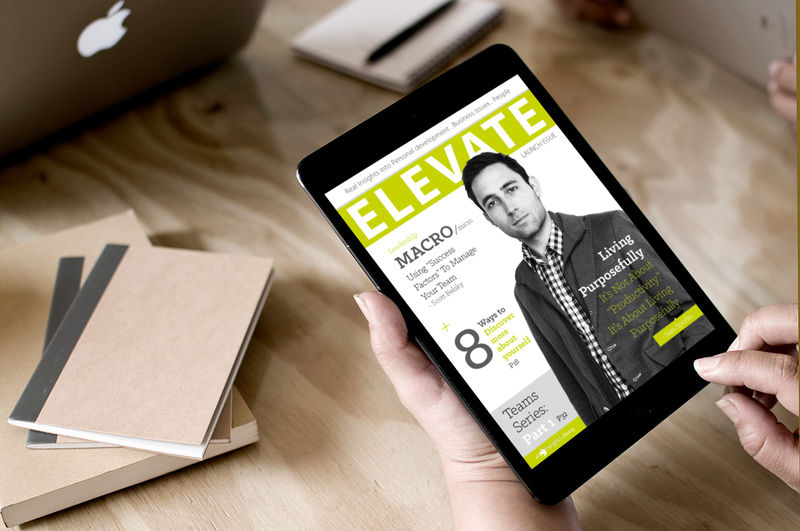 ELEVATE Magazine is a conceptual digital publication focused on challenging existing thinking on the most pertinent business issues through a focus on people development and practical people based solutions that can be put into practice immediately. 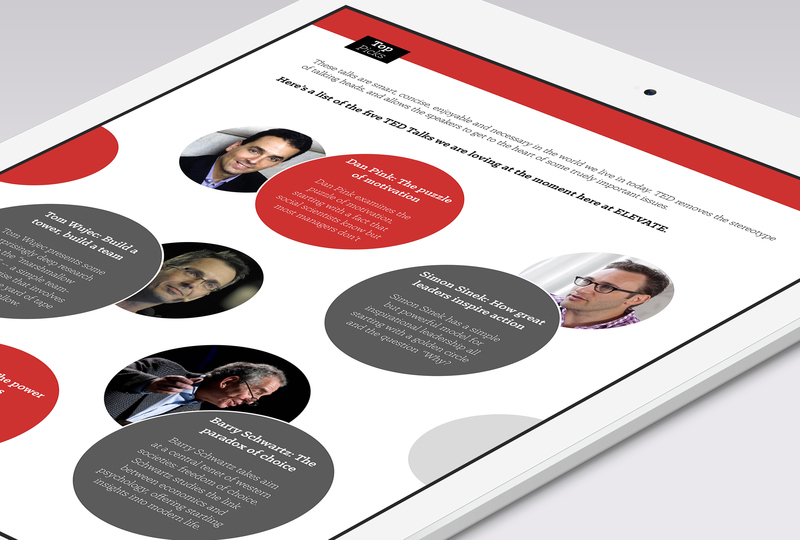 ELEVATE Mag is a digital publication for the likes of newstand for iOS. These are some concept mockups that helped direct the idea. 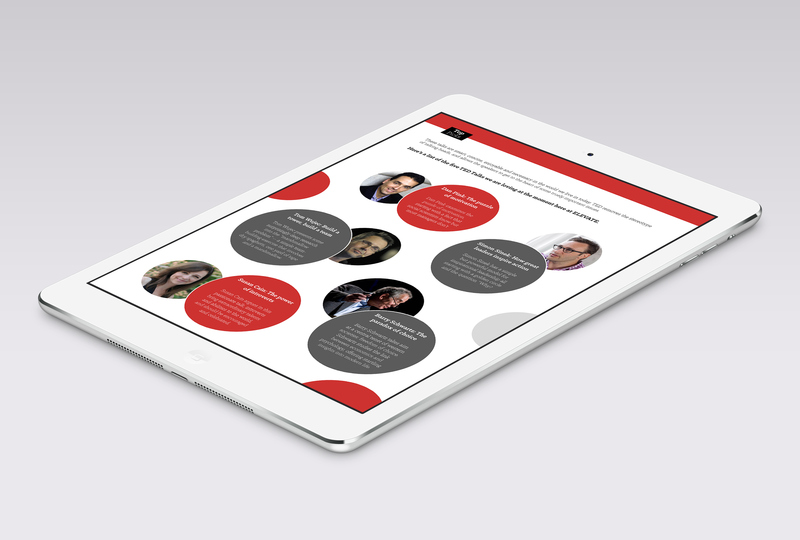 ELEVATE magazine aims to challenge existing thinking on the most pertinent business issues through a focus on people development and practical people based solutions that can be put into practice immediately. Our values are centred entirely on people, the most valuable commodity an organisation possesses and the only one that cannot be replicated. 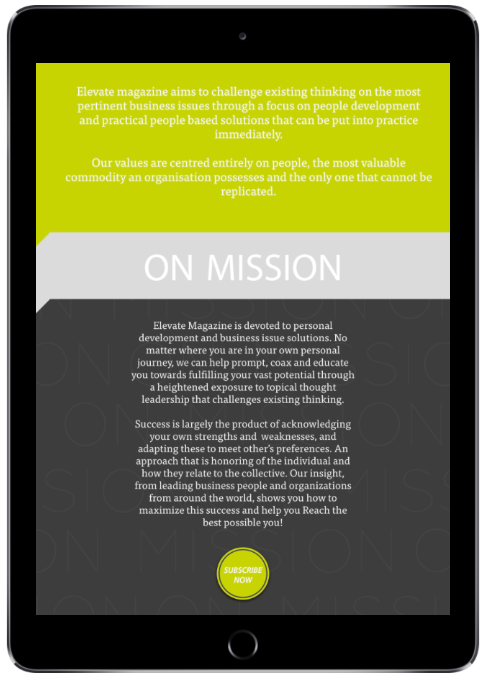 Our Mission: Elevate Magazine is devoted to personal development and business issue solutions. No matter where you are in your own personal journey, we can help prompt, coax and educate you towards fulfilling your vast potential through a heightened exposure to topical thought leadership that challenges existing thinking. Success is largely the product of acknowledging your own strengths and weaknesses, and adapting these to meet other’s preferences. An approach that is honoring of the individual and how they relate to the collective. 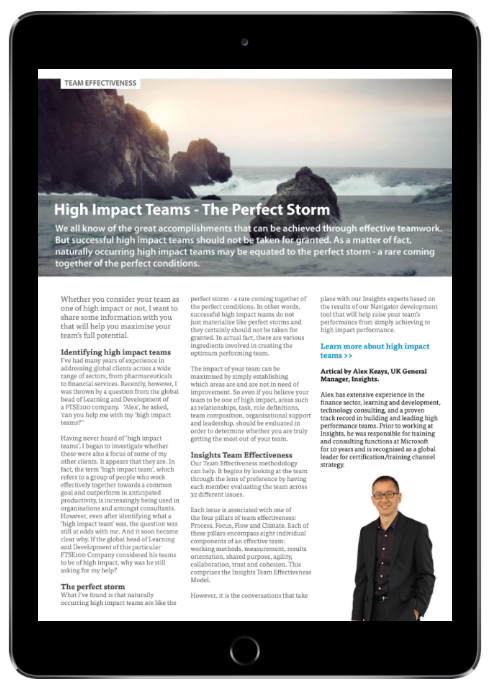 Our insight, from leading business people and organizations from around the world, shows you how to maximize this success and help you Reach the best possible you! 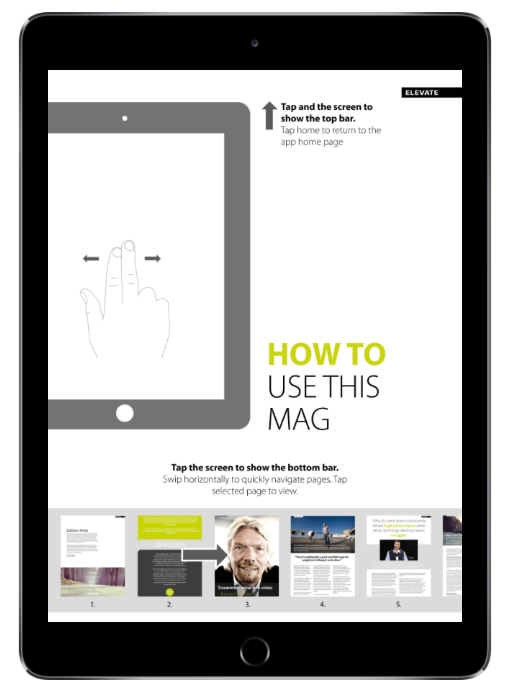 ELEVATE Mag is a digital publication for the likes of newstand for iOS. These are some concept mockups that helped direct the idea. 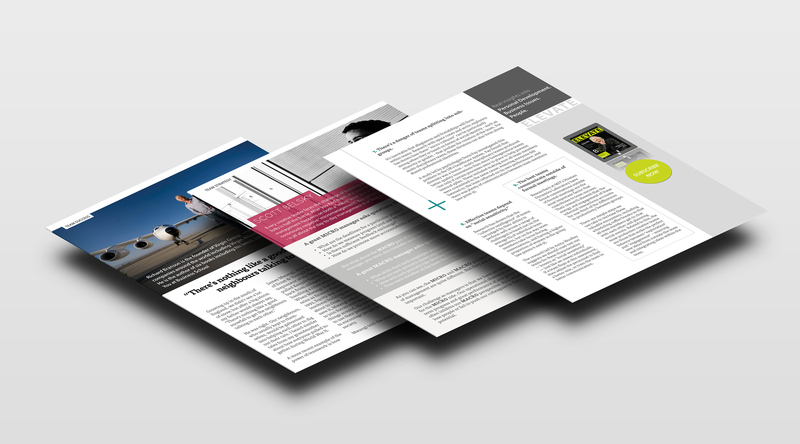 ELEVATE magazine aims to challenge existing thinking on the most pertinent business issues through a focus on people development and practical people based solutions that can be put into practice immediately. Our values are centred entirely on people, the most valuable commodity an organisation possesses and the only one that cannot be replicated. 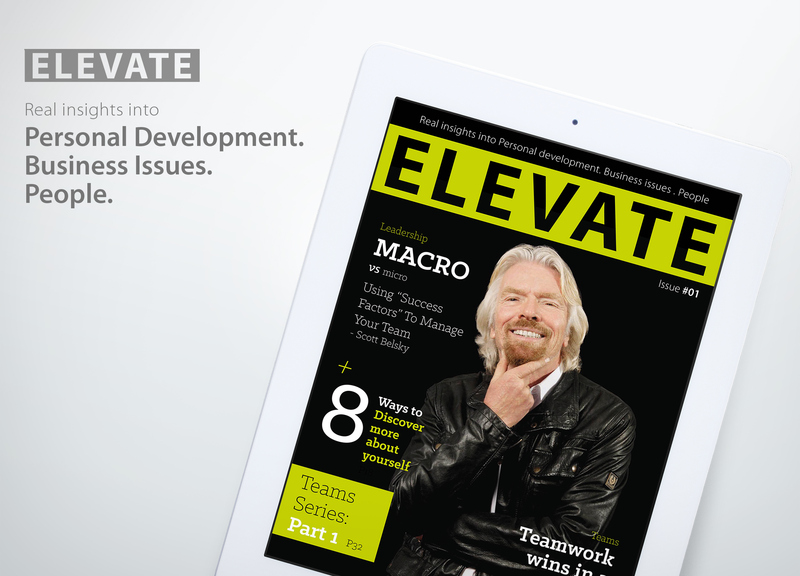 Elevate Magazine is devoted to personal development and business issue solutions. 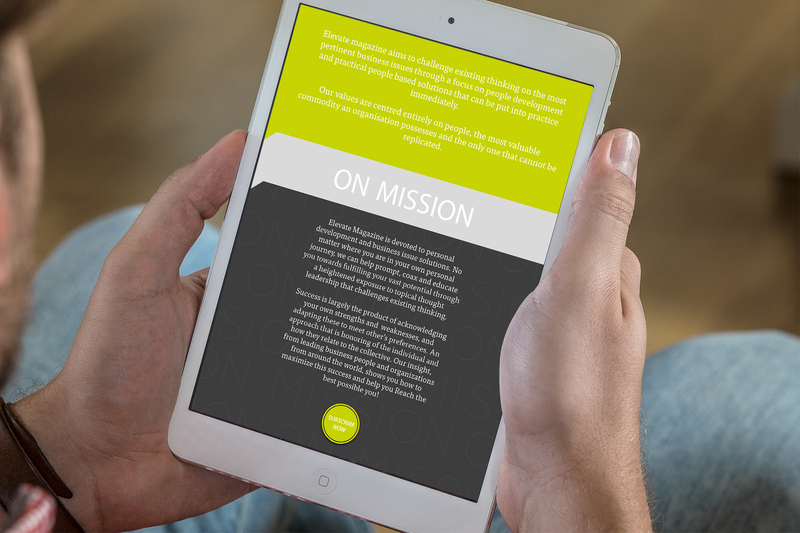 No matter where you are in your own personal journey, we can help prompt, coax and educate you towards fulfilling your vast potential through a heightened exposure to topical thought leadership that challenges existing thinking. Success is largely the product of acknowledging your own strengths and weaknesses, and adapting these to meet other’s preferences. An approach that is honoring of the individual and how they relate to the collective. 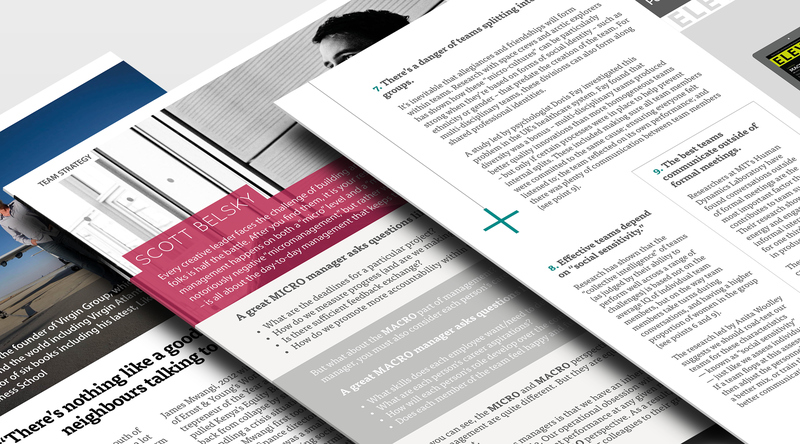 Our insight, from leading business people and organizations from around the world, shows you how to maximize this success and help you Reach the best possible you! All content has been curated and is used simply for prototyping purposes to illustrate a concept.